I'm a gnarly old hook maker from the sticks. See that avitar? 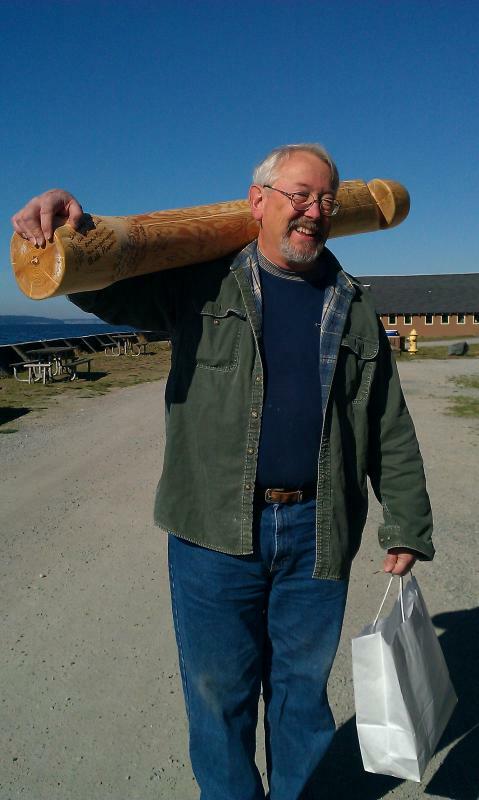 That's me carrying Diplohookticus Jimbosei, the world's biggest crochet hook. I make smaller hooks too. Making crochet hooks is my most favorite thing to do. Ok, another April 1 under the ever so lengthening Jimbo belt. Best to start thinking of something new and revolutionary for next year, eh? Actually this one came as close to being an actual revolutionary new hook shape as any. Too bad it didn't crochet so well. Ah well, as Patty Page used to say... Kay Sara Sara. Heh fooled you again.... that was Doris Day, not Patty Page. Oh well. It'll come. Stick with me kids. one of these days it's gonna be move over Bates and Boye. heh I better hurry up though. Seems that I'm getting older in my slow age. Aw thanks! That particular piece of wood just begged to be a artsy looking hook. Now the April 1 hook... you know what? I almost decided to start making that hook shape because it actually worked for my daughter in law who tests my crazy ideas from time to time. I'd made a smaller version (the one in my blog's a P) and she liked it. But it definitely takes some getting used to. The amazing Jimbo has done it again! A totally new concept in Hook Design, so revolutionary, the major hook manufacturers are thinking of converting to kni##ing n##dles or early retirement. Come visit my blog (click below) and see the newest development in hooks since Bates and Boye. Is that one of those light up rings that you squish and it blinks? Great idea.. as well as the beads, button and FF. Good job!! You're going to make someone happy with that. A worthy topic for a PHD thesis, twiddleworthy, texture or silky. Might break down gender lines eh? Aside from being a fantastic idea and a very kindhearted thing to do, it'd be a great way to depleat an overstocked yarn stash. One of the things that struck me; it reminded me of my middle son when he was 2 or so, used to grab his blanket with "pickers" (short tabs of yarn) that he would twiddle with while nodding off to sleep. Maybe we gradually revert to our baby years as we grow older. I know I've a habit picking up and rubbing a smooth rock and that's probably why I make my hooks fondleable. But back to the Twiddle worthy items, aside from the crocheted bobbles etc, I'd vote for really smooth buttons and beads. At least that's what I'll want on MY Twiddle mit. This is such a fantastic idea and such an great thing for crochetiers to do. Totally reinforces my opinion that crochet begets kindness. Darski, I just wish I could punch that "like" button a couple million times more! Howdie from Northwest US, and welcome! Wow!! Can I be your grandson? Hi Mary from Spokane WA. Welcome! Hmmmmm I usually recommend a K. My reasoning is that larger hooks make larger loops that are easier to see both by the student and teacher. Not spoken from vast experience, but from my own meager attempts at crochet and watching my grandaughter learn.